Polyethylene (PE) is the most well-known and frequently used of all polymers. Despite its wide range of applications many questions remain regarding the manner in which PE chains organize in the polymer matrix. We study this organization at cryogenic temperature by doping PE films with strong fluorophores and performing polarization dependent single-molecule spectroscopy and single-molecule position determination (microscopy) experiments on them. These chromophores, whose optical properties have been well characterized in the past, act as nano-probes sensitive to both dynamics and local orientation of the surrounding PE matrix. If we precisely measure their lateral positions and orientations, they will act as local reporters of their environments. For this our PE samples need to be thin, homogeneous and optically clear. Recently we have published our first results from single-molecule experiments on spincoated polyethylene films doped with terrylene (Tr) or 2.3,8.9-dibenzanthanthrene (DBATT) . Perfectly clear films have been produced with a thickness of 100 to 200 nm. Of the two systems we tested, DBATT in polyethylene proved the most practical for single-molecule experiments. We aim to use this system to study the length-scale of locally increased order in the semi-crystalline polymer polyethylene. Figure 1 shows how the orientation of single molecules can be determined. 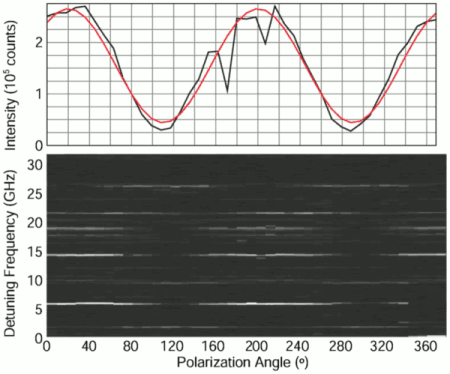 Figure 2 (a) shows that images with good signal to noise ratio may be acquired, allowing for position determination with an accuracy of around 0.1 pixel which corresponds to about 10 nm. 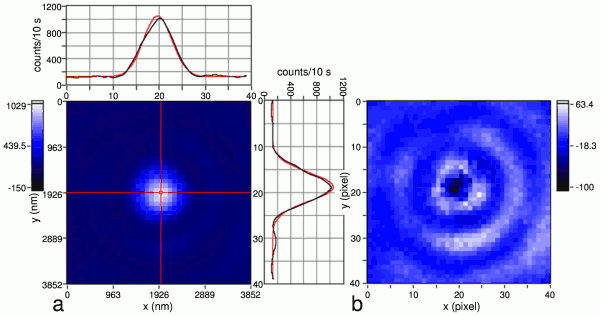 Figure 2: (a) Diffraction-limited fluorescence image of a single DBATT molecule in spincoated HDPE (1.8 K, magnification factor 208, acquisition time 10 s, circularly polarized Iexc=0.7 Wcm-2) and x- and y-cross-sections of the image (black line) and of the fitted 2-D Gaussian (red line). Corresponding nanometer scale axes are given. The intensity scale was adjusted to maximize image contrast. The diameter (FWHM) of this spot equals 698 nm. Prior to image acquisition, we measured the orientation of the in-plane dipole-moment of this molecule with an accuracy of about 5°. (b) Residual image after subtracting the 2-D Gaussian from the original image.